There's a couple of difficulties with your count consideration. The first thing is that your third wave extension has the center point of 3 as your shortest wave and you have (as minimal as it is) overlap between waves 2 and 4 within this same extension both of which are critical no-no rules with the methodology. Something in which I've found useful when attempting to apply an Elliott count to a currency is that a monthly scale can sometimes give better insight because of the trading nature of the market itself. 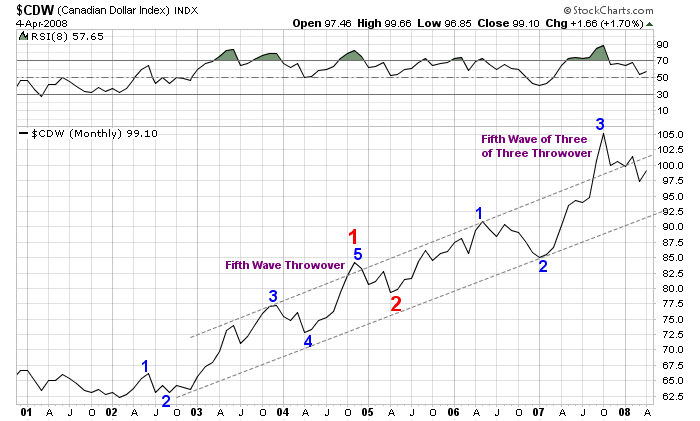 With this in mind, and using a 8 period RSI, I've quickly marked up the chart below that would be more in line with the rules of Elliott...especially when we do consider that several Canadian commodity related markets that still have some upside still left in them based on the price pattern of gold itself over the last several months/years. Dave, many thanks........I know that there are many Elliott rules to apply and also that there are exceptions and several possible counts at any given time....thats why I greatly appreciate your input. If I understand your count, we are in wave 4 of Primary 3 suggesting alot more upside particularly if we get a 5th wave extension. Leaving TA aside for a sec, a $CDN at say $1.20 implies a horribly weak USD, and either a booming CDn economy with a significant Interest rate premium over the US and or a horribly weak US Economy that forces the Fed to make many more cuts or both.